I’ve reviewed short stories here and at my old blog for many years now. Not quite on a weekly basis, not all the time anyway, but pretty close. These are some of the reviews I ran at Ready When You Are, C.B. in the years 2009 to 2011. I’m slowly migrating all of my old posts over to this new site. I just can’t bare to lose them all. The literature text book I use with my 7th graders has a short play in it called “A Defenseless Creature” by Neil Simon and based on a short story by Anton Chekhov. It’s a simple scene about a woman who describes herself as defenseless and the banker she tries to get her husbands back wages from. The fact that the banker has nothing whatever to do with the woman’s husband does not deter her from begging and pleading for the money. It’s a very funny scene that never fails to get lots of laughs from my students. So I thought why not use the entire play? 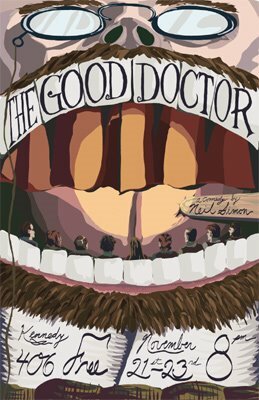 “The Good Doctor” is a very funny collection of nine skits based on the short stories of Anton Chekhov. They make for amusing reading and would have been excellent for use with my students, but for the last skit. Even when Chekhov is at his most farcical, as he is in “The Sneeze,” he still manages to make a point or two about life in his times. In “The Sneeze,” an average worker goes to the theatre on opening night. He is a devotee of the arts and saves all the money he can to spend on good seats. Before the play begins he realizes that the couple sitting in front of him is his employer and his wife. The man becomes uncomfortably aware that his situation is awkward. What will his employer think about his presence in such an expensive seat on opening night? Should he greet his employer? Can he use this opportunity to advance his career? Unfortunately, as the play begins, the man sneezes an enormous sneeze directly on the bald head of his employer. My students would have loved this. The rest of the play is just as funny and still manages to have a point. There are lots of parts, enough for every student in the class. It’s perfect. Right up to the very last skit. In “The Arrangement” the author’s father takes him to visit a brothel on the occasion of the young man’s birthday. It’s a very good skit, touching actually. The young man is nervous, worried about what is going to happen and what he’ll be like afterwards, unsure that he wants to become a man so soon. The father is understanding, carrying on a tradition his own father started, but not quite sure himself that he wants his son to become a man. Can this wait another year? I liked the skit. I also like my job and want to keep it. So we won’t be using Neil Simon’s “The Good Doctor” in my seventh grade class. Sometimes the whole point of a science fiction short story is a bit of a gimmick, but that’s okay if the gimmick works like it does in Jack McDevitt’s short story “Never Despair.” If you’re a student of history, particularly of World War II then you could probably guess the gimmick from the title, even if I had not included a picture of Winston Churchill. Knowing the gimmick ahead of time should not spoil the story for you. Centuries into the future, our civilization has fallen. The cities, towns and roadways that are present day America have become overgrown like ruins of the Mayan empire. A small group of treasure hunters have wandered further away from their own town than anyone before them. They seek Haven, the place where a legendary figure once stored all of the knowledge of the ancients. Only two members of the original party survive, Quait and Chaka. They camp inside an ancient underground grotto. During the night a strange figure appears. Chaka wakes, sees him and confronts him. He is unarmed, says he lives in the grotto, says he is the last one left. Chaka tells him about their attempt to find Haven and that they are probably about to give up the search and return home. He offers her words of encouragement. “It is possible you will not succeed. Nothing is certain, save difficulty and trial. But have courage. Never surrender. Never despair.” Sounds like Winston Churchill to me. Is he a ghost? Is he some sort of hologram in a museum interacting with a visitor? Chaka never finds out. Will she take his words to heart and keep looking for Haven? “Never Despair” asks the reader to write their own ending; my answer is yes. You can find “Never Despair” in the anthology Wastelands edited by John Joseph Adams. Since buying my first iPod earlier this year, I have become a fan of several short story podcasts. Subscribing to podcasts through iTunes is free. There are a growing number of excellent short story podcasts at iTunes including Podcastle, the fantasy story podcast. Don’t run away yet, non-fantasy readers. At Podcastle, fantasy doesn’t mean unicorns and elves–once in a while sure, but not every week. The fantasy genre is exploding these days; all sorts of new ideas, new settings, new fantasies are taking shape. The genre has come a long way since Bilbo Bagins first headed east to rob a dragon. One of my favorite stories from Podcastle is Helen Keeble’s “In Ashes” first published at Strange Horizons. From the time my twin brother and I were four, our mother only gave us raw food. Opening Line “In Ashes” by Helen Keeble. “In Ashes” is a masterful piece of story-telling. Ms. Keeble grabs the reader’s attention from the first line and holds it throughout by slowing teasing out information, answering our questions in ways that lead to more questions. Why does the narrator’s mother only feed her children raw food? Is she abusive? We soon find that the narrator’s brother can sense the slightest trace of heat in cooked food even food that has been left to cool for days. For this reason his mother keeps him out of sight, locked indoors most of the time. They live in an isolated forest cabin. His father wants nothing to do with him and has taken his two older sisters away to live in the next town over. When the narrator takes him to see their father in an attempt to win their father’s love, her brother becomes mesmerized by the sight of a lit fireplace. What is the boy’s obsession with fire? How strong is the bond between twins? What will one give up in order to save the other? As she tells her story, Ms. Keeble introduces the reader to her fantasy world. She does this slowly enough and convincingly enough to bring along more skeptical readers. The reward at the end of the story is worth the suspension of disbelief. “In Ashes” makes for excellent listening. I read three very funny Grace Paley short stories this week all from The Collected Stories. All three were unexpected. All three were fun. In “The Loudest Voice” the local grammar school presents its annual Christmas pagent. This year young Shirley Abramowitz will get the leading role, because she has the loudest voice. Her Jewish mother is horrified to find her daughter starring in a Christmas pagent. Her Jewish father thinks it’s nice that all the children will learn the culture of their new home. The rest of the local Jewish community is divided, but they all attend the show, proud parents that they are. In “The Contest” a man who never married, what with one thing and another, is reunited with a girl he liked in high school. She wants him to help her make some real money by entering a newspaper contest the local Yiddish paper is holding. For the contest they have to identify three Jews in the News based on only the vague hints the paper prints each day. Every day for several weeks, the two meet and review that day’s clues. The prize is 5000 dollars and a trip for two to Isreal and three of the major capitols in the Free West. But they can only go together if they are married. “An Interest in Life” opens with a man leaving his wife, Virginia, and their four children. Afterwards, Virginia has to deal with her neighbors, her family, the welfare people. It all leaves her feeling a bit lonely. Every Thursday, John Raftery comes to visit his mother who lives in the same building Virginia does. His mother insists that he meet her and soon the two are meeting every Thursday. Virginia suspects her husband will never come back home, but he is hesitant to take her relationship with John to a more physical level. John is great with her children, good to her, probably falling in love her. What’s a mother to do? Up early or late, it never matters, the day gets away from me. Summer or winter, the shade of trees or their hard shadow, I never get into my Rice Krispies til noon. I am ambitious, but it’s a long-range thing with me. I have my confidential sights on a star, but there’s half a lifetime to get to it. Meanwhile I keep my eyes open and am well dressed. He did know. His red face reddened further. John Raftery has had that color coming out on him boy and man from keeping his rages so inward. 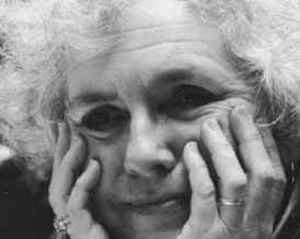 If you’re looking for some fun, try Grace Paley. The Miller plays a bagpipe. He is a drunk who rides a broken down horse but he insists on leading the other pilgrims out of town as he plays. It’s easy to accept this description as summing up his character. But, he is also a genius of a storyteller. Even his tale is easy to dismiss. The beautiful Alison has married an older man, a rich carpenter. Nicholas, a young clerk, rents a room in their home. Soon, Nicholas wants to sleep with the beautiful Alison. A second clerk named Absolon is also in love with Alison, but his love is loftier–he wants only a kiss. A marvelous plot follows as each man tries to secure Alison for himself, ending with everyone getting exactly what they deserve: a nightmare kiss, a smack an the behind with a hot poker, and a broken arm. Alison emerges unscathed. “The Miller’s Tale” is two old tales united by a single word–“Water!” In the first Nicholas tricks the gullible carpenter into believing a second flood is imminent. To save his young wife he must hang three separate containers from the ceiling of his workshop. Each of them must hide in a container and wait for the rain to begin. Of course, Nicholas intends to spend the night with Alison while the carpenter sleeps high above the ground. . In the second story, Absolon, who is in love with Alison, determines he should come to her window to beg a kiss. She is annoyed by this so she tells him to close his eyes and pucker up. Then she sticks her naked behind out the window. He is so enraged that he has been tricked into kissing her behind that he grabs a hot iron from his friend the blacksmith and comes back seeking revenge. This time, Nicholas presents his behind out the open window only to get a smack with a red-hot poker. By this point in the story, most readers will have forgotten that the carpenter is still asleep, high in the rafters. Thinking the flood has come, he cuts the ropes and plummets to the ground smashing the barrel and breaking his arm. The Knight refers to destiny, to fates being written in the stars and lives controlled by gods we cannot fathom. He even features descriptions of three temples, one for each member of his love triangle. The Miller mocks this idea with his own presentation of three vessels hanging from the rafters and the Miller’s mistaken belief that God is about to flood the world again. At the end of “The Knight’s Tale” king Theseus makes a speech explaining how the world is an ordered place, and everyone must perform their role within that order. At the end of “The Miller’s Tale,” the old carpenter who ought to be revered as the wise king, has been rendered a complete fool. What he says about having been tricked is true, but none of his neighbors believe him because Alison and Nicholas have already told them that he is obsessed with Noah. The Knight presents an ordered world; the Miller knows that order is an illusion. 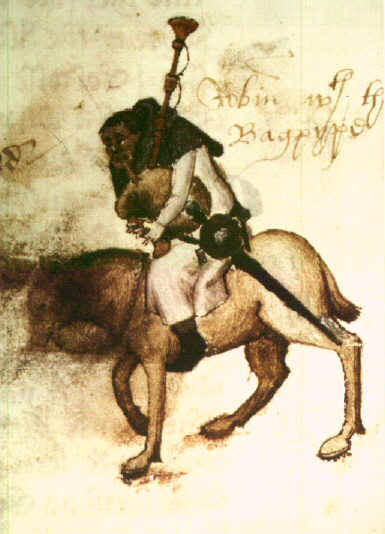 Full Disclosure: The image of the Miller comes from the Ellsmere manuscript. My inadequate translation of the opening lines is as follows: Once, at Oxford there dwelled a rich oaf, a carpenter who took in borders. It was common during the middle ages to tell stories of Noah’s wife refusing to board the ark, which is why three separate containers are justified. Earnest Hemingway’s “A Day’s Wait” is a slight piece, something so subtle that it’s importance is easy to miss. A father and son on a winter day in Minnosota. The son, Shotz, is sick, running a fever. His father is worried but his son reassures him, tells him it’s okay, encourages him not to be concerned. The father goes hunting. (It is a Hemingway story.) He talks to the boy afterwards and learns that the boy thinks he is going to die. It can be difficult to see what’s happening in a Hemingway story. Little things become important, common words become meaningful. Hemingway’s stories look like they should be easy to read, but they’re really not. I have been using “A Day’s Wait” with my 7th graders for years with mixed success. While I think it’s a wonderful short story, it’s a challenge for 7th graders. I’m sure the editors who put out literature text together thought they would understand a story about a seven year old, and that they would appreciate how the child tries to act like a grown-up in the face of death. But I’ve found both of these are a tough sell. This year I started using a new literature series that includes “Through theTunnel” by Doris Lessing. In “The Tunnel” Jerry, a young boy slightly older than the boy in Hemingway’s story, decides he is old enough to spend his summer days swimming with the bigger boys instead of playing on the beach he and his mother have shared for years. The big boys make a sport of diving under the water and swimming through a long, rocky tunnel. Jerry decides he will do this and begins training, diving down the bottom of the sea and holding his breath for longer and longer amounts of time, until his head begains to ache and his nose to bleed. On the last day of their vacation Jerry makes his attempt and swims through the tunnel to the other side. In the closing paragraphs of each story, both boys return to a childish state, Shotz cries “easily over things of no importance” and Jerry jumps around his mother bragging about how long he can hold his breath. Both literature series’s instruct the teacher to discuss how the boys are both more grown up and still just as childish as they ever were. Both stories do an excellent job of illustrating this odd part of childhood, the way a person can be both mature and immature at the same time. They both do a wonderful job of it, too. But it’s a difficult concept for middle schoolers, who are both childish and grown-up, to appreciate. It’s a lesson one learns afterwards, an observation a parent makes. If you back me into a corner, I’ll tell you that “A Day’s Wait” is the better story, but I’ll also tell you that “Through the Tunnel” is the best choice for inclusion in a middle school literature series. The seventh graders have always been a bit lukewarm with Shotz’s story, but the sixth graders loved Doris Lessing’s tale of Jerry and his swim through the underwater tunnel. You can find the complete text of “A Day’s Wait” here. 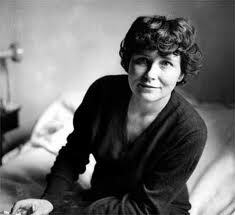 The complete text of “Through the Tunnel” by Doris Lessing can be found here. A friend of mine has a habit of going to the zoo whenever there’s a typhoon. He’s been doing this for ten years. At a time when most people are closing their shutters, running out to stock up on mineral water, or checking to see if their radios and flashlights are working, my friend wraps himself in a Vietnam-era army surplus poncho, stuffs a couple of cans of beer into his pockets, and sets off. He lives about a fifteen-minute walk away. Opening to “New York Mining Disaster” by Haruki Murakami. I used to live in San Francisco’s Sunset District, just about a 40 minute walk away from the San Francisco Zoo. This was in the late 1980’s when the San Francisco Zoo was had a certain down-on-its-luck feel. The entry fee was low enough for a college student with a part time job in a downtown hotel to visit on the spur of the moment one rainy afternoon. The zoo is a remarkable place in the rain. Most of the animals have enough sense to take shelter during a storm, but some, like the elephants, are too big to take cover and some, like the tigers, keep up their daily habits regardless of the weather. But when it’s raining, most of the tourist and families stay away, so you can have the animals to yourself for a while. Though it never occurred to me, you could probably sneak a can or two of beer in with you like the narrator’s friend in Haruki Murakami’s short story “New York Mining Disaster” does. The rules are different in the rain. The rules are different in Haruki Murakami stories, too. The narrator borrows his friends suit to wear to a funeral. Five of the narrators friends have died in a single year. None of the deaths are connected to each other at all; the narrator’s lost friends didn’t even all know each other. Illness, accident, happenstance. Five in a single year. The narrator’s friend explains that since he purchased the suit, a dark one, specifically for the purpose of going to funerals, not a single person he knows has died. Haruki Murakami stories are like that. Something strange happens, a pattern of events seems to appear. The characters try to make sense of it or ignore it altogether and go about their normal routines–work, relationship, trips to the zoo in the rain. Look for deeper meanings and you’ll find none. As I said at the beginning, there’s no real moral or lesson to be learned from all this. But this is something that actually happened to him. Something that happened to all of us. That’s why when he told me his story, I couldn’t laugh. And even now I can’t. I can’t explain why Mr. Murakami’s fiction touches me as deeply as it does. If you could explain this to me, I wouldn’t let you. I’d run from the room. I’d delete your email. I don’t want to know why. A man alone, drinking a beer in front of the elephant enclosure on a rainy afternoon. No further lesson or moral is needed. I already know all I need to know. Did Lizzie Borden take an axe? Angela Carter examines the character and her situation in “The Fall River Axe Murders.” Her telling of what happened on the day of the crime stops short of the murders. Instead, Ms. Carter looks at Lizzie Borden’s life, her family, and what was expected of young women in late 19th century America. The ways of New England families are Ms. Carter’s subject. Could they lead one young girl to murder her father and step-mother? It’s a fascinating story, one full of more suspense than you’d expect. It reminded me of a production of Medea C.J. and I saw several years ago starring Fiona Shaw in the title role. The play’s conceit was to set the action in a more modern apartment building with Medea as an upwardly mobile housewife. The audience all knows how the play will end, but Ms. Shaw’s performance kept us on the edge of our seats the entire time. We just couldn’t quite believe that she would do it. Not this Medea, this woman loves her husband and her children far too much to go through with it. She seems a little crazy, and it’s clear what she’s thinking of doing, but it’s also clear she doesn’t want to. Right up until the final moments before the murders we all thought this Medea would have a different ending. The end result is a terrific short story. One that works as a thriller and as a piece of literature, even as feminist literature. If you’re looking for a break from more difficult feminist reading or if you just want a brief foray into a darker world, “The Fall River Axe Murders” is just the ticket.”The Fall River Axe Murders” works the same way. I expect that when Ms. Carter wrote the story Lizzie Borden’s innocence was already established–I believe most historians now agree it was someone else, maybe the minor character Ms. Carter writes out of the script in the opening pages of her story. 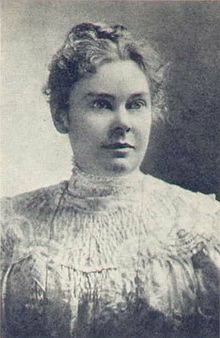 But Lizzie Borden’s innocence or guilt is immaterial as far as “The Fall River Axe Murders” is concerned. The question of the crime’s cause, what might lead to such an act, are what interests Ms. Carter. Maybe Lizzie Borden didn’t take an axe, but she had reason to. I’m glad you are saving all your old reviews here — I bet it’s fun to read back over what you thought about these stories. And I heartily concur with your thoughts about Grace Paley — as it happens, I just read my first Paley story (“Telling”) this week for Deal Me In, and I loved it. It was not a funny story, although there was certainly humor in it. But it was just an overall excellent story by a great writer. I agree with Randall’s comment above and am happy to read your “backblog” of reviews from your old site. You probably know I am a Murakami fan as well and,like you, would be hard pressed to explain why I like him so much. Your two sentences, “the rules are different in the rain” and “the rules are different for Murakami too” do a good, succinct job of summing up one of the things I like about him, though, “New York Mining Disaster” has always been one of my favorite stories of his and, predictably, I couldn’t exactly say why.